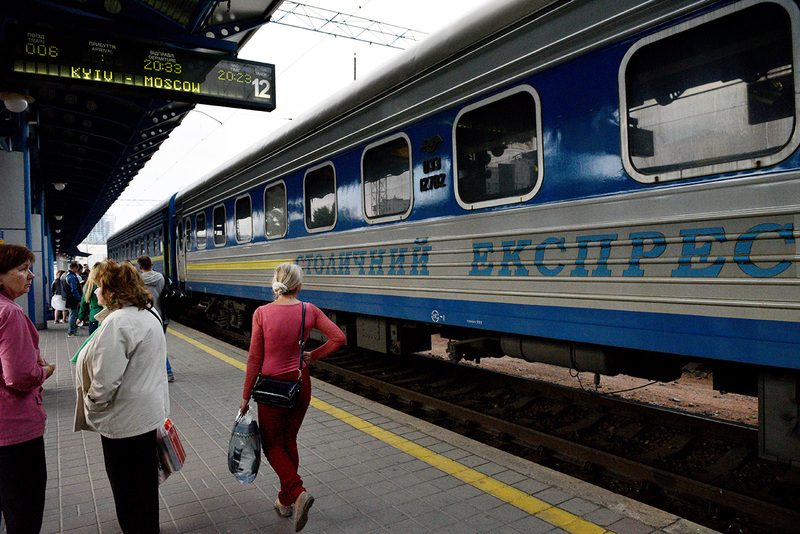 According to media reports, Ukraine is planning to cut off passenger rail traffic with Russia. The Ukrainian government said the issue was currently not on the agenda, but added that this would be a desirable move. Earlier, Ukraine severed freight rail traffic with Russia. RBTH takes a look at what other Russian things Ukraine has banned in recent years. Reports that Kiev was considering severing passenger rail traffic with Russia first appeared in the Russian newspaper Kommersant. Commenting on those rumors, Ukrainian Minister of Infrastructure Vladimir Omelyan said that "currently this issue […] was not on the agenda," at the same time adding that any transport links with Russia should be cut. This sentiment is hardly surprising because over the past three years – against the backdrop of the conflict in Donbass, and the loss of Crimea – Ukraine has banned many things that have anything to do with Russia. A ban on passenger rail traffic between Ukraine and Russia, which amounts to some 2 million people a year, looks quite likely since Kiev has already banned freight rail traffic from Russia. When on May 16 Ukraine enacted sanctions against Russia's Federal Freight Company (FGK), a subsidiary of Russian Railways, the company had 6,000 freight cars on Ukrainian territory. They must leave the country by the end of May. Ukraine has also banned the loading and movement of freight cars belonging to several other Russian companies. Two years earlier, air travel between the two countries was also severed. In fall 2015, Kiev imposed sanctions on several Russian airlines, including the largest, Aeroflot, due to its continued flights to Crimea, which Ukraine does not recognize as part of Russia. In response, Moscow banned five Ukrainian airlines from carrying out flights to Russia. Ukraine upped the ante by banning all air travel with Russia in October 2015. A month later, Kiev completely closed its airspace to Russian aircraft. "Russia might use Ukrainian airspace to carry out acts of provocation," said then Prime Minister Arseniy Yatsenyuk, explaining the government's decision. After direct flights between Russia and Ukraine were banned, people started making the journey via Minsk. Yet, for Russians it’s not easy to get to Ukraine even through the Belarusian capital. In April 2014, as authorities launched the so-called "anti-terrorist operation" in the rebellious parts of eastern Ukraine, Kiev in effect banned entry for all Russian men between the ages of 16 and 60. To enter the Ukraine, Russian males in this age group must provide a notarized invitation from a Ukrainian resident. According to social media reports, in 2014-2015 Ukrainian border guards banned thousands of Russians from entering the country without any explanation. Even the famous Kremlin critic, former billionaire oligarch Mikhail Khodorkovsky, who is supportive of Ukraine’s government, urged them to abandon this practice as it created problems for "tens of thousands of ordinary people." Bans on entry to Ukraine have affected not only "ordinary people" but also culture figures famous in both countries, many of who have Ukrainian roots. Kiev imposed an entry ban on dozens of Russian authors, singers, actors and comedians, considering them a threat to national security because of their statements in support of Crimea's reunification with Russia in 2014, as well as their sympathy for the unrecognized republics in Donbass. In recent months, Russian cultural figures have been banned from entering Ukraine if they earlier visited Crimea. Kiev insists that the peninsula can only be entered from the mainland, crossing Ukrainian border points. One such ban received a lot of publicity when it affected Russia's participant in the Eurovision song contest, Yulia Samoylova, who in 2015 visited Crimea on a flight from Moscow. In addition to Russian cultural figures, the Ukrainian blacklist features foreigners, including actors Gerard Depardieu and Steven Seagal, as well as directors Emir Kusturica and Oliver Stone, because they do not share Kiev's version of the tumultuous events of the last three years. According to media reports, Ukrainian authorities banned not only Russian cultural figures but also films and shows featuring them. In total, Ukraine has now banned dozens of Russian films and TV series. In June 2015, it even adopted a special law that forbids the demonstration of films made in Russia and that "promote the military and law-enforcement structures of the aggressor country," (as Kiev refers to Russia, seeing the conflict in the east of the country as resulting exclusively from Russia's influence, and refusing to see any internal Ukrainian reasons that may have caused the confrontation). In addition, Ukraine has stopped broadcasts of dozens of Russian TV channels. In September last year, a list of over 70 banned Russian TV channels got two new additions: a sports channel "Our Football," and a children's TV channel "Carousel." The most controversy was caused by a ban on the Russian opposition channel, Dozhd TV, which does not support the Kremlin's policy on Ukraine. Nevertheless, Ukrainian authorities explained that Dozhd TV was banned because its website showed Crimea as a part of Russia. Ideas that present a danger to Ukraine's national security also cannot enter the country in the form of books. Since the start of 2017, Ukraine has a law that bans "printed materials of anti-Ukrainian nature" from import into the country. According to the Ukrainian publication Strana.ua, as a result of the law Russian books and other printed materials stopped entering the Ukrainian market altogether. The power to decide which books are "anti-Ukrainian" and which are not is in the hand of a special commission. However, by the time the law came into force it had not yet been set up. A month later, the commission still hasn’t been created. In May, a new procedure for bringing in books from Russia was introduced. To obtain permission to bring a book into the country, one needs to present an expert's opinion on the contents of the Russian book. All these restrictions are supplemented by broad economic sanctions on the import of Russian goods, a ban on any military-technical cooperation with Moscow, as well as the latest wave of sanctions from Kiev, which affected 468 Russian and Ukrainian companies, including the owners of Ukraine's most popular social network VKontakte and Yandex services.